Ron Howard's latest film about the 1976 Formula One racing season is a welcome departure for the journeyman filmmaker. Rush is an extraordinary true story told very lavishly without the baggage of most sports stories as it focuses on the sometimes intensely bitter and enthralling rivalry between drivers James Hunt and Niki Lauda. Rush thrills as a true life drama and thrilling sports spectacle presented tightly in full cinematic glory. 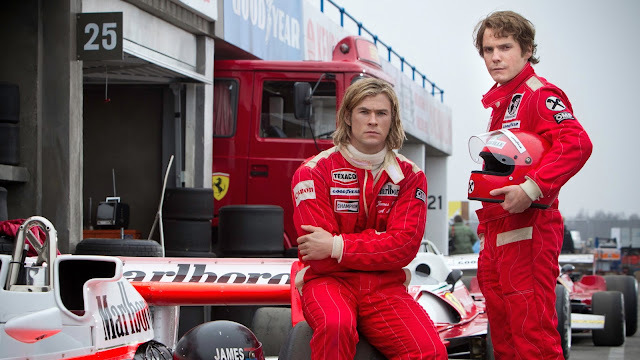 Chris Hemsworth plays the hard partying, wreckless Englishman James Hunt to the socially awkward, precision obsessed Austrian Lauda (Daniel Brühl). Brühl is remarkably enticing and intriguing as he channels Lauda's affectations and demeanour, portraying the tightly wound driver with dry wit and a light playfulness. Hemsworth lives it up and reveals Hunt's maddening obsession with racing when he's not enjoying life and indulging all manners of vices. Screenwriter Peter Morgan (The Queen) strips the story down to the bare essentials, only exploring part of the pair's careers and personal lives with a healthy dose of dramatization. Lauda lives by a hard rule. He knows every race could be his last and accepts nothing more than a 20% chance of death before driving. While fairly predictable and by the numbers plotting wise, Morgan and Howard use racing to form the story's narrative, driving past any plot bumps. Dogma cinematographer Anthony Dod Mantle's touch is felt in every frame on screen. His almost period, grainy, stylish aesthetic intermixed with archival race footage builds the film beautifully. The '70s European setting is so much fun and intriguing cinematically. Hans Zimmer accents the film well with a pulsating theme. Its overall construction and executed feel true to the spirit of racing and these characters. It's a fairy tight film so laser focused on these two men in one year and virtually nothing else. It's only major misstep is the very ending and coda that's almost the complete antithesis of the how the rest of the film is constructed. Brühl has a clunky voiceover as the two say their goodbyes and exchange regards after the world championship. With a throwaway line mixed with footage of their real life counterparts, he mentions Hunt's later celebrity life and early death at age 45. By making it a part of the film's proper story, it brings us out of the moment in time. Hunt's peak and Lauda's later reclaimed glory voiced explicitly are jarring and out of place. Howard adeptly gets across the skill, strategy, and precision involved in Formula One racing. Hemsworth and Brühl's chemistry as Hunt and Lauda is compelling as they walk a tote rope of utter hatred and contempt with admiration and respect. It's a conventional yet daring film about somewhat unlikeable protagonists with memorable performances by Hemsworth and Brühl.